An 18 month old female Cane Corso in Ohio was taken for a walk on a warm (85 degrees) summer day. One minute she was fine. The next she collapsed. She was rushed to the owner’s home by animal control, seizing and barely conscious. Despite the efforts of her loved ones, this poor beautiful dog passed away. Was this dog’s death preventable? I believe it was. Have you ever walked outside in the summertime and exclaimed to yourself or to a family member, “it is hot out here!” I live in Arizona where every day in the summer is hot. Very hot. Surface of the sun hot. If you answered yes, consider how your dog must feel. Dogs, in general, are at high risk of suffering from heat exhaustion and/or heat stroke just because of how their body works. This is because, unlike humans, dogs do not perspire to cool down; instead they pant. Although panting does help dogs cool down it is not as effective as perspiration. In addition, dogs have fur which is another reason why they heat up so quickly. As in the case of the Cane Corso, heat stroke can happen suddenly and the signs are not always obvious if you aren’t paying attention. Some of the symptoms include excessive thirst, thick saliva, restlessness, rapid heartbeat, drooling and lethargy. Why Can’t I Walk My Dog In The Summer? In short, dogs are not good at keeping themselves cool. They are completely reliant upon us, their owners, to make decisions about the heat that will keep them safe. What many dog owners don’t realize is that the air temperature is NOT an accurate reflection of ground temperature at all! Asphalt and other ground surfaces retain heat and this temperature rises exponentially as heat and sun exposure continues. This infographic is a great illustration summarizing a study that was done in 1970 by James J. Berens, MD and published in the Journal of the American Medical Association which involved accident victims who sustained burns on their skin from the highway pavement at surprisingly low temperatures in summer climates. The temperature correlations shown here are based on asphalt that was in direct sun with little wind and low humidity. Furthermore, the time of day is also very important to keep in mind. 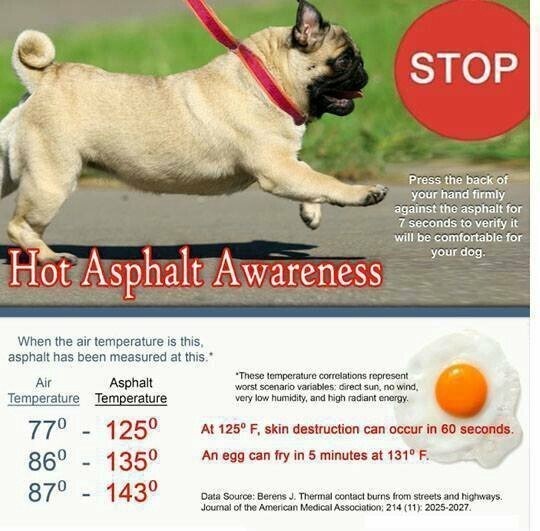 Asphalt soaks up the heat all day and can only cool down at a certain rate and only when the sun retreats- so pavement that was deemed safe for a walk at 9 am may differ greatly at lunchtime and early evening. If you live in Arizona all bets are off. Unless global cooling takes over the sunny southwest, there is NOT a good time to walk your dog outside. Period. 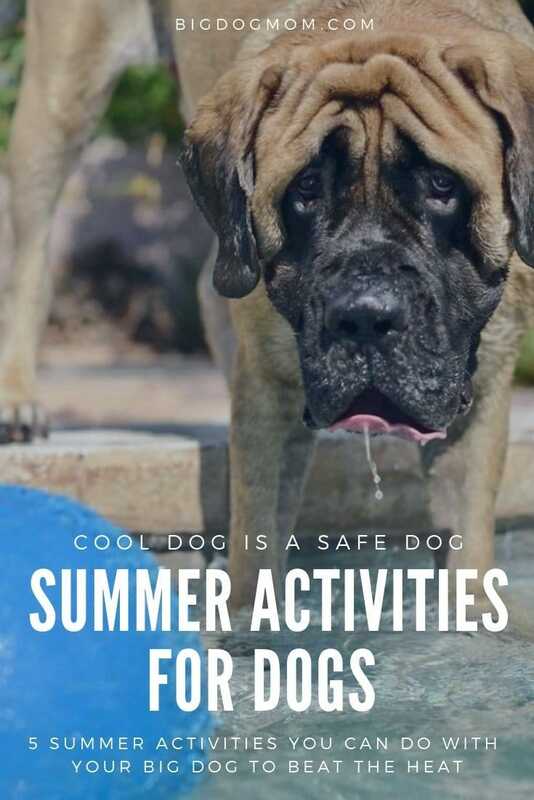 So, if you are someone who is in the habit of succumbing to those big brown eyes begging for his daily walk around the neighborhood, consider these cooler alternatives in order to keep your big dog safe this summer. Swimming is one the single best activities to do with your big dog. In addition to keeping your dog cool, swimming helps strengthen muscles, keeps ligaments and tendons flexible, prevents obesity and increases circulation. And, especially important for us big dog owners, swimming is a low impact activity. This is because the water supports much of your dog’s body weight and inhibits sudden excessive movements which can cause injury. For older dogs or dogs with arthritis or sore stiff muscles this is an ideal setting in which to strengthen muscles and exercise in a gentle setting. In the near future, I will share some tips on how to teach your dog to swim. I am not an expert, but I have learned a few force-free tricks over the years that have enabled me to share my love of swimming with my big dogs. And if you don’t have access to a pool, I would highly recommend getting an inexpensive baby pool like the ones that are commonly sold outside grocery stores, Walmart and Toys R Us. Your big dog may not be able to swim in it, but he will be able to play and get wet, both of which are fun, cool and safe! It is not just air conditioning you are after with this one. Socialization is important for ALL dogs, during ALL stages of their lives. However, if you have a puppy, be sure to read A Bomb Proof Big Dog Starts With A Socialized Puppy. In there I provide some fantastic tips and additional ideas on ways to socialize your puppy. There are many retail stores that allow friendly, well-behaved dogs. The following is a short list of our local favorites, but I would love to hear from you. Do you have any pet-friendly stores you like to take your big dog to? Sulley and Junior love to play! If I go to the toy basket, grab a ball, and head into the living room you can visibly see their eyes light up. I try to vary the games I play with them in order to keep them guessing and having fun. One day we will play fetch and retrieve and the next we will play catch the ball in the air. When we play indoor games I like to mix in a little obedience too. For example, “sit,” then “down,” then “stand,” and “catch!” Or I will stand still and when I get eye contact (instead of clicking) I will toss the ball. As I said, I try to mix it up. The Ultimate Tool Guide for Trimming Dog Nails and More! Nose work is a sport you can start to do with your dog at home even before taking a formal class. And it is something you can do every day with your dog. I started doing nose work with Junior a couple months ago and we absolutely love it! You can read our story in Nose Work Is Not Just For Bloodhounds And German Shepherds. In that post I provide numerous resources to get you started as well as several videos showing Junior and I in action. Nose work provides intellectual stimulation like few other dog sports. It requires the dog to rely entirely on one of his most powerful senses… his nose. And, while you wouldn’t think so by watching them, they are burning lots of physical energy as well which results in a more content pup. Lastly, nose work allows you to create a stronger bond with your dog as you learn to observe, understand, and rely upon him. What an awesome partnership you will be building with your dog! Play dates are not just for children. My friends jokingly call my home “Stephanie’s Doggie Day Care” because I truly have opened up my home to my friends dogs. When you have your friend’s dog over to your house or vice versa, not only are both dogs getting much needed socialization and exercise, but you are too. Part of being raised to be a bomb-proof big dog includes going to new places, meeting new people, and kindly greeting new dogs. These are all accomplished during a doggie play date. And, bonus, you don’t need to be in the hot sun to do it. It absolutely breaks my heart to see and hear of dogs like the Cane Corso succumbing to the heat in such a tragic and precipitous way. I do believe her death was preventable. But it does no good to sit here and judge her owner for what they should have known or should have done differently. They have learned a heartbreaking lesson with the sudden death of their beautiful young dog. Please share this post with your friends and loved ones. While there are no statistics on how many dogs die every year from heat exposure because most go unreported, I have to believe there are several hundred deaths every summer. Preventable deaths. Don’t allow for one more dog owner to say “I didn’t know,” “It didn’t feel that hot to me,” or “I didn’t think…” This summer should be an opportunity to create memories with your dog, not memorials for him. Please click the buttons below and share this important message today! OMD, I feel so awful about that dog who passed away from heat exhaustion. We lived in Phoenix for 10 years and just moved back to NY last year. I was SO conscious of walking my dogs in that extreme heat. Most of the year we confined our walks to very early mornings and late evenings, and made lots of trips to PetSmart as an activity! In NY we have the humidity to deal with, particularly for our Husky. She really doesn’t handle it well at all. In that respect I’m kind of glad Summer is coming to an end and Fall is almost upon us. People don’t realize the impact the sun can have on dogs. Oh, Cathy, I couldn’t agree with you more. The heat can be so dangerous and it can hit your dog suddenly and seemingly without warning. I’m so happy for you that you were able to move to NY. Poor Icy – I’m sure he looks forward to the cold winter months all year long.